Selenis Leyva is a Latina of Cuban-Dominican origin who has conquered audiences in the hit Netflix serie, Orange is the New Black. Selenis has been a faithful supporter of our Foundation and now is part of the Maestro Cares Ambassadors program. 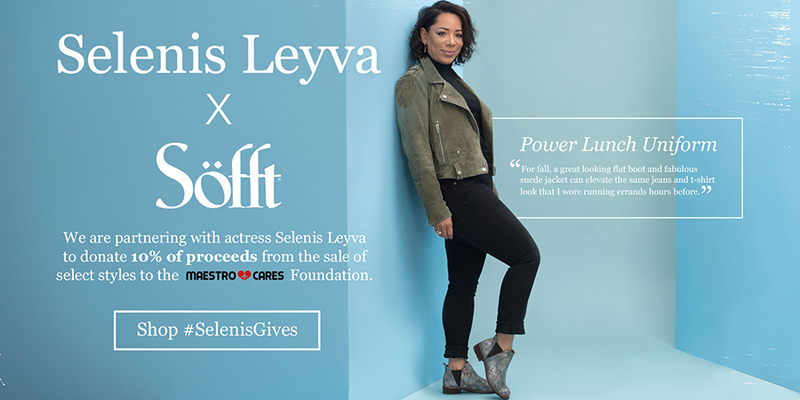 During the month of November, Söfft Shoes and Selenis Leyva, have joined forces to support all children in need of Latin America and the United States. For each style of shoes selected by Selenis, Sofft shoes will donate 10% of the value of the purchase. You can also support our foundation by signing up to Söfft Shoes List, for every email collected the shoes Company, will donate $1 to Maestro Cares Foundation. Our Goal is to collect 5000 emails.